What a gorgeous jewel box of a dance event is this. Five new ballets choreographed by five brilliant choreographers, describing stories and sensibility through movement, not found before. Everything about this show is very fine. From the production and lighting values. creating tone and atmosphere, to the live music and the nuanced dancing by the talented performers of the New English National Ballet Theatre. Before each ballet starts a filmed, short interview with its choreographer is shown, providing insight into their motivations and intentions as well as giving a glimpse into the development of their work in rehearsal. The first two pieces share the tonal quality of dreaming as they explore the inner life of being. The first of these is choreographed by Marcelino Sambe, the award winning Royal Ballet Soloist, and is titled the Land of Nod. It is made for four dancers, the single female exploring the extraordinary freedoms and fluidity of movement in dreams, as she is carried away. Sometimes by one man, sometimes by two and on occasions by all three together. Such stuff are dreams made of indeed. Strangers, by George Williamson, is based on a poem by the Poet Laureate, Carol Ann Duffy. It starts in a silence interrupted by the resonating first movement of Brahms Piano Sonata in E Minor, played with great sensitivity by pianist, Anne Lovett and cellist, Anna Menzies. It’s lovely. Mr Williamson communicates his intentions most effectively in the interesting introduction to the work. It’s about two estranged people looking back from the end of their love affair to its hopeful beginning. Each partner being represented on stage by three dancers. The illusions created by the interlocking movements of these dancers working together as if they are one person are by themselves worth coming to this show for. It is by this means of combination we are shown attachment and difference as connection or separation, as each of the lovers are observed to struggle with opposing desires, to break free or to stay. It’s an insightful depiction through movement of the inner life of the break down of a relationship. 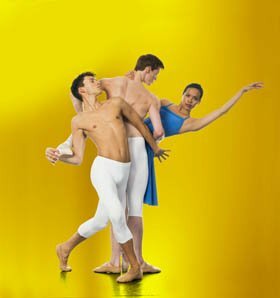 The male dancers, Pablo Luque Romero, Nathan Hunt and Seauma Wilkinson are remarkable for their versatility here, moving with ease from the delicacy of unity to the masculine physicality of a desire for difference. Marvellous. The costumes complement the changing nature of inner life perfectly. And the set is a clever wonder of hanging crystals as ice or light. Guiding this journey from separation to togetherness to being alone again. Moonshine, choreographed by Kristen McNally, has a different tone. Performing to the earworming film score of The Grand Budapest Hotel, the eight dancers are dressed in stripey pyjamas, reminiscent of classic cartoon prison outfits. Which is appropriate because, while the happy music swings on the dancers are moving with rigidity, as if repressed. Or suppressed. Looking through a telescope describes the anxiety of surveillance. Folk dances are performed, all the familiar Mazurka movements of raised and linked arms are there but with joy eliminated. Forcing us to think about that. There are marvellous ensemble sections. For example, towards the end of the piece the dancers work together with expressive movement to summon up a searing group association with Munch’s painting, The Scream. After the interval, there are two more new pieces to enjoy. First of all, Enticement’s Lure, choreographed by Valentino Zucchetti, which describes the roles temptation and seduction play in destroying relationships of happiness. We learn from Valentino’s introduction to his work that the Artistic Director of the New English National Ballet, Karen Pilkington-Miksa chose the music and then he set about communicating feeling through movement, working with the dancers experimentally before firming ideas into structure. The music is Rachmaninov’s Trio Elegiaque No.1 in G Minor. Music of want. It’s wonderful and the sense of it has been captured perfectly.The set design, by Ilaria Martello stuns from the start. It’s both magnificent and simple. The male dancer representing temptation carries knowingness with him and his, female equivalent is irresistible as she casts for the partner of another, who is unable to resist despite the attempts of his love to call him back. But then she falls to temptation too. The force that is desire in all the wrong places has been communicated. The evening ends with Vortex. Choreographed by Daniela Cardim, it is a response to the drawings of the Royal Academy of Arts sculptor, Ann Christopher and, also the exciting piece of classical music which Daniela bring to our attention from her native Brazil. It’s by a composer famous there, Camargo Guarnieri, but not well known in the UK. The set by April Dalton sets the tone of somewhere in the tropics. It’s a piece sensitive in tone. Moving from hot to cool and back again during the three movements of Guarnieri’s work. In the first movement eight dancers, four male and four female’s dance in gaiety together in light and warmth. Reducing to two couples moving through the shade described in the second movement before we move back to heat to finish the show. Quint-Essential is a show of excellence, providing an opportunity to see these talented emerging ballet dancers, choreographers, designers and musicians at work. If you go, you will not regret it. In fact, you might well want to go back to enjoy it all over again. New English Ballet Theatre returns with a programme showcasing five new works from the UK’s top choreographic talents. The Royal Ballet’s Marcelino Sambe creates his first work for NEBT to the music of Nathan Halpern. The Royal Ballet’s Kristen McNally and Valentino Zucchetti return to choreograph new pieces, with Zucchetti featuring music by Rachmaninoff, performed live by emerging pianist Anne Lovett. Daniela Cardim Fonteyne creates a dynamic new peice, highlighting the physicality and youthful energy of the company’s dancers, while English National Ballet Associate Artist George Williamson presents Foreign, a new work based on Poet Laureate Carol Ann Duffy’s poem, set to Brahms’ cello sonata and played live. Dancers: Zoe Arshamian, Diogo Barbosa, Alexandra Cameron-Martin, Giulio Galimberti, Bethany Headland, Nicola Henshall, Nathan Hunt, Pablo Luque Romero, Alexander Nuttall, Cecilia Pacillo, Riccardo Rodighiero, Hannah Sofo, Isabella Swietlicki, Seamus Wilkinson. Age Restrictions: Children under 5’s are not admitted.